The NAVC varve sequences are available here for download with recent corrections of the old NEVC and the renumbering of varves to the NAVC system (AM varve years). 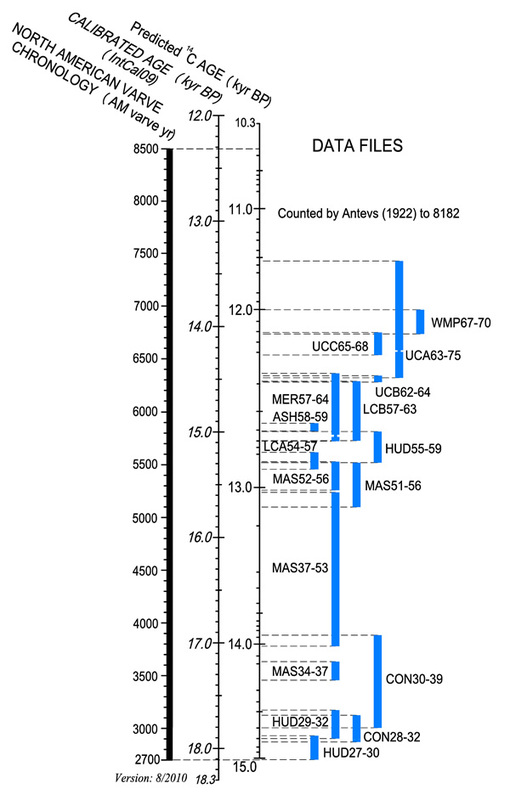 Individual varve sequences can be downloaded: 1) from the varve file menu, 2) from a map showing their geographic location (area from which varve sections were measured to produce the varve sequence), or 3) from a timeline. You also have the option of downloading a folder with all of the files. The downloadable data files are all ASCII text files as described below in the menu. For links to other varve sequences and records in the northeastern U.S. and adjacent Canada that are not part of the NAVC go to Additional N. American Outcrop/Core Records. All files are ASCII text files assembled with AM varve year (1st column) and couplet thickness in centimeters (2nd column). Comments related to corrections that were made to the old NEVC are in the 3rd column. All numbers sited in descriptions of data files below are AM (NAVC) varve years. AM varve years run from low number (older) to high number (younger). Right-click on any of the links in blue below and choose "save file as..." or " save link as..." to download the desired file. Those links that are named XXXXfolder are .zip archives which contain the associated text files. You must uncompress these files using 7zip (free), winzip (fee) or the integrated Windows or Mac decompression utilities. All items below are links to individual NAVC data files, none more than 22 KB in file size. HUD55-59AM.TXT 5520-5815, Hudson Valley, NY, NY 13-14 plots of Antevs (1922). 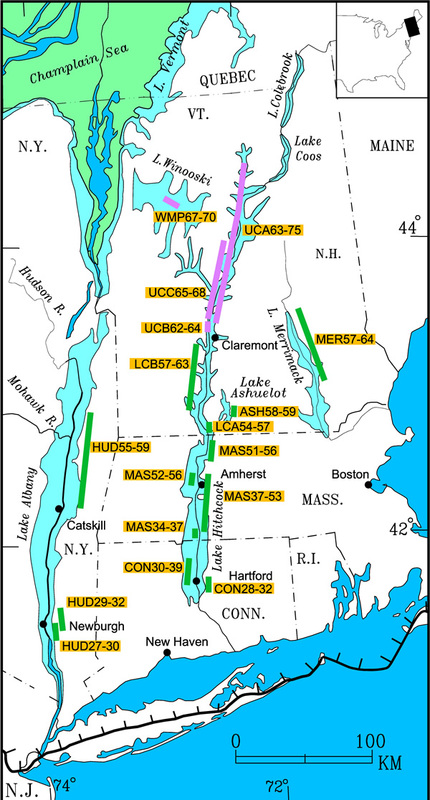 Note: An error was found in Antevs’ (1922) original NEVC varve sequence when it was matched to the varve records from cores in the Connecticut Valley at UMass Amherst (UMass core) and at North Hatfield, Mass. (NHT core). NAVC varve AM 5691 now includes the consolidation of flood events that were originally counted as separate varves by De Geer (as reported in Antevs, 1922). The floods were created in the Hudson Valley during one year by the release of water in a lake in the Mohawk Valley. For more information see NAVC Today and also Forming the NAVC–NEVC Corrections. The map below has links that allow you to download the individual varve sequences of the NEVC according to the location or section of a valley where varves were measured to create the sequence. The timeline below has links that allow you to download the individual varve sequences of the NEVC according to age. The plot shows how the different sequences of the NEVC overlap in time.